Noel Counihan and his wife Pat spent 1980–81 on a working visit to Europe during which they stayed from February to June 1980 at Opoul, a small Catalan village in south-west France. In the published text accompanying the portfolio, Pat Counihan explains that they were drawn by an interest in the depopulation of the countryside, called locally 'lle desert rural' – and by the character of the people and landscape, as relayed to them by Australian friends and former occupants of the apartment in which they stayed. 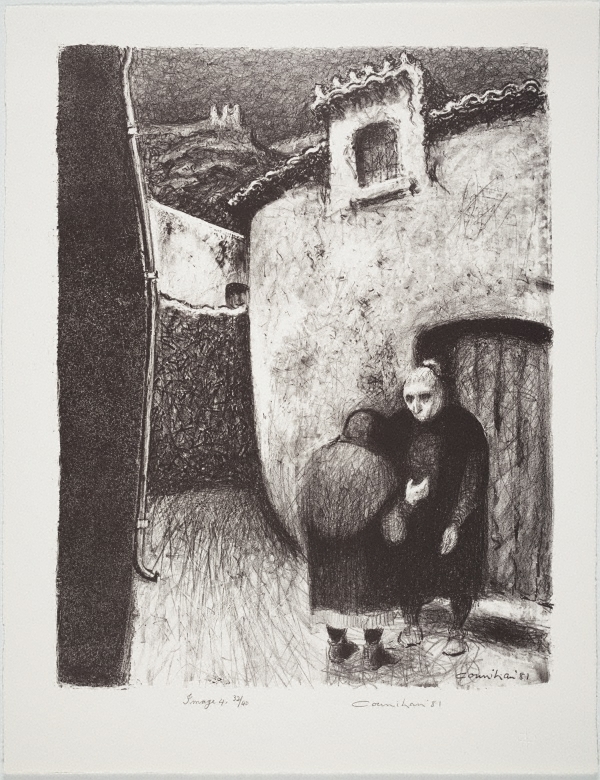 According to Robert Smith, who published a catalogue raisonné of the artist's prints in 1981 ('Noel Counihan prints: 1931–1981', Hale & Iremonger, Sydney), the lithographs were drawn by the artist (eleven on lithographic stones; one no. 7, on a zinc plate) and printed by John Robinson of Druckma Press, Melbourne during March & April 1981 for the publishers Port Jackson Press, Sydney in association with Realities Gallery, Melbourne. The portfolio was to be launched in September 1981 as part of an exhibition by Counihan at Realities Gallery – which included paintings and drawings related to the prints. Inscribed with signature and dated on stone to print l.l. corner "Counihan '81". Signed l.r beneath image, pencil "Counihan '81".